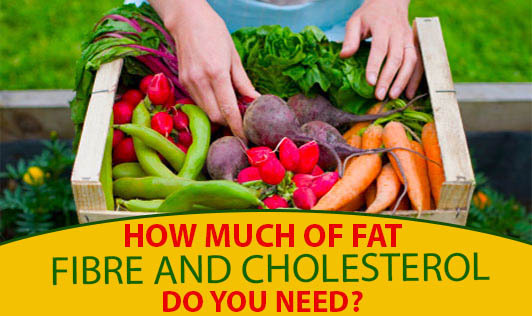 How much of fat, fibre and cholesterol do you need? Fat fibre and cholesterol are probably the most used words in the language of urban health and nutritional science for several decades, their importance and more so their reputation (good or bad) has been discussed and debated I plenty in the best two decades. Fat and cholesterol have even managed to create fear in the health-conscious people. • Helps in synthesis of bile acids which are required for digestion. The requirements of these components vary from pediatric stage to geriatric stage, and in wellness and illness. Fat: A normal, healthy child from 1-18 years of age needs 25grams of visible fat per day. This would mean a combination of ghee or butter and oil that is used in cooking. A healthy adult above 18 years of age is allowed 20 grams (about four teaspoons) of visible fat per day. Senior citizens with no health problems are allowed the same quantity of visible fat on a daily basis. The requirement of fat for people with special needs as in sports or pregnancy would increase based on individual needs. Dietary fibre: there is no fixed requirement of fiber for children. However, children need much less fibre than adults do. As long as their vegetable, fruit and grain intake is within normal limits, their fiber requirement will be met. The requirement of fibre in a healthy adult is 30 to 35 grams per day. A senior citizen with no digestive issues can continue to eat 25 to 30 grams of fibre per day. Dietary fibre is present in fruits, vegetables, nuts, seeds, pulses, legumes and grains, and absent in animal foods, oils and sugar. Cholesterol: Cholesterol is present only in animal foods. There is no specified requirement for cholesterol through daily foods. Healthy professionals in the western countries do not recommend more than 300mg of cholesterol per person per day. However, we don't want to copy the western diets because we are genetically different and our dietary habits vary to suit the climate and foods available locally. Upper limits for each of these food components in our diet mean that excesses can be harmful.